Miami University researchers have received a grant to support development of a graphic novel format for inquiry-based instruction for science education. The Ohio Department of Education has awarded a grant of $93,242.15 to Miami University College of Arts and Science and College of Education, Health and Society for their project entitled “Writing Inquiry Stories to Explore Science (WISE Science).” Led by Miami University’s Center for Chemistry Education, this partnership will provide professional development for Ohio 6th to 8th grade educators in partnering Middletown City Schools. Building upon the Center for Chemistry Education’s efforts during the 2014-2015 school year, the WISE Science project provides a model for teachers to use in their classroom inquiry-based teaching and learning activities. Last year’s process used inquiry stories and student characters to design investigations. In their inquiry stories, the students were asked to notice something in their daily lives and, after discussion, develop a testable question and experiment. The story the kids created became a draft for an experiment the students could visualize. While the concept of a written story was well-received, based on teacher feedback and collaboration, a graphic novel or comic-book style reading material emerged as the solution to engage reluctant readers. So, the Center for Chemistry Education transformed the science inquiry stories into comic book style readings. “Basically, this is a project that uses a graphic novel format in inquiry-based instruction for science education,” described Dr. Tammy Schwartz, Department of Teacher Education’s Instructor and Director of the Urban Teaching Cohort. 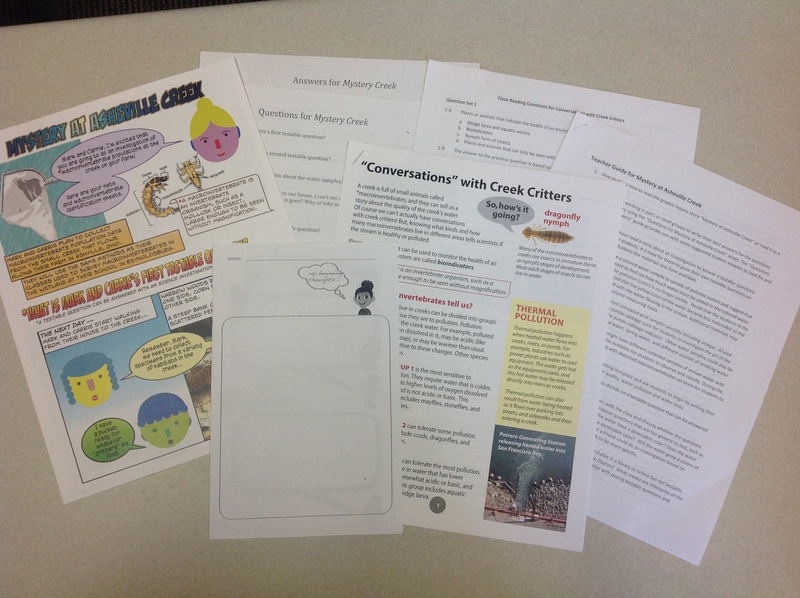 These graphic inquiry stories were designed to step students through the scientific process: posing a testable question, designing an experiment and collecting data, and using results to make a claim with evidence. The collaborators of this project hope to foster an energetic response from urban schools that traditionally shy away from an inquiry based curriculum. The Center for Chemistry Education will train teachers in urban classrooms to move away from seatwork, explicit directions, and tests towards a more critical-thinking environment. By doing so, their goal is to improve student learning and results on state tests and other key indicators. “It has become clear to me that the [inquiry process] helps [the students] solidify what they have learned and emphasizes those big ideas of science,” said middle school special education teacher Janet Frasher. Over the coming summer, a group of 6th to 8th grade teacher leaders will participate in a summer program to learn inquiry teaching skills using comic style inquiry and magazine style content readings. They will then partner with Center for Chemistry Education staff throughout the school year to create Inquiry Cycle lessons to support their physical, earth, space, and biological science lessons in the classroom. Additional science and language arts teachers as well as intervention specialists will learn about and use the Inquiry Cycle lessons developed by the teacher leaders. Middletown City Schools anticipate that reading improvement will result in improved performance on the state assessments. This award is effective January 20, 2016 through May 31, 2017, and is directed by Susan Hershberger in the Department of Chemistry and Biochemistry, Jennifer Blue in the Department of Physics, and Tammy Schwartz in the Department of Teacher Education. Written by Andrea Rahtz, Copywriter/Digital Marketing Specialist, College of Education, Health, & Society, Miami University. Item originally appeared here. Kid in the creek photo by Camp ASCCA via Flickr, used under Creative Commons license. This entry was posted in Research stories and tagged award, research, stem, STEM education. Bookmark the permalink.